Though they’re a relatively new band, you wouldn’t know it by how much Minneapolis’-own 3 Pill Morning have been touring lately. Following the release of their debut album, they’ve toured with the likes of 12 Stones, Shinedown, In This Moment, Sevendust and more. Now they’re back with some added dates for their upcoming spring tour with Trapt as well as some new dates for their early-summer tour with Hollywood Undead. 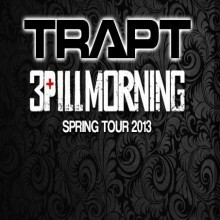 MINNEAPOLIS, MN – Midwest hard rock act, 3 Pill Morning, has added to its spring/summer touring schedule, announcing several additional tour-dates with Trapt, as well as an extensive run with Hollywood Undead, Escape The Fate and more beginning in late June. 3 Pill Morning will continue its relentless touring in support of its record label debut, Black Tie Love Affair , which released last spring on A2Z/Page 2 Music/eOne. Stay tuned to the official 3 Pill Morning website: www.3pillmorning.com and Facebook page: www.facebook.com/3pillmorning for the latest information.